Tropical Storm Bonnie is set to affect South Carolina today and through Memorial Day weekend as it makes landfall. The entire East Coast can expect to see some rainfall as a result, please check your local listings for specific amounts relating to your location. 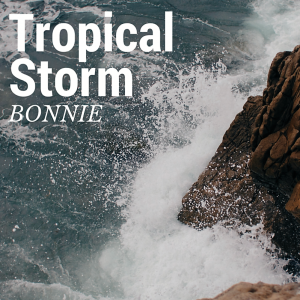 While Tropical Storm Bonnie is not predicted to become a hurricane, it will still bring heavy rains, winds, rip currents, thunderstorms, lightning, and even possible tornadoes. Residents should prepare for flood-like conditions, especially those who live on or near the coastline, in a floodplain, or are in the direct path of the storm. Remember, hurricane season officially begins June 1st – Jeff Atwater, Florida’s CFO’s website has useful information on this topic consisting of free downloadable PDFs here.